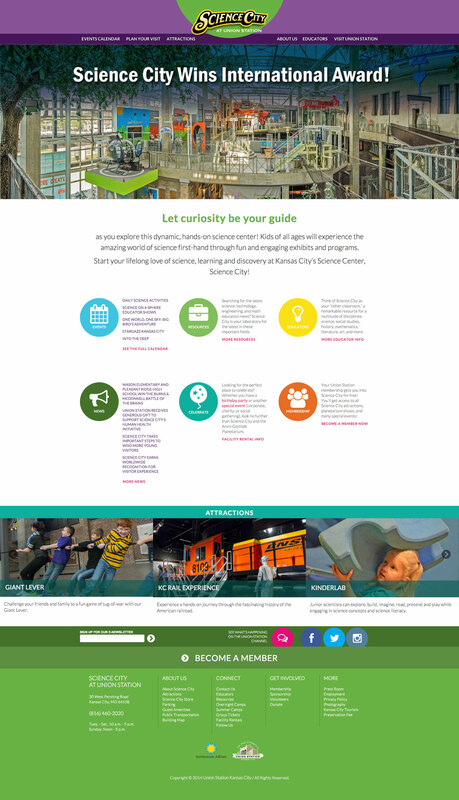 This updated web presence and digital strategy for the venerable Kansas City institution Union Station and Science City was a result of partnership with Kansas City web technology firm kctechworks. This project, over the course of many months, proved to be a fascinating and educational. The previous site, built more than a decade ago, no longer suited the organization’s needs. A new site not only had to be contemporary and functional — it had to drive a new digital strategy, and help the teams who had built up processes around a digital strategy they had outgrown create new avenues of communicating with their visitors and supporters. The new suite of sites–which included a related, but individual site for their sister organization Science City–served as a centerpiece of this new strategy.